Wesley and Taylor have an incredible love story! They first found a mutual attraction towards each other in middle school, which didn’t progress into a romantic relationship until the end of their high school years. What started off as waving to each other from the school bus, progressed into an inseparable relationship. Wes and Taylor have weathered through long distance together due to Wes’ career in the military. Ultimately though, it has brought them closer together. They admire each other for their compassion, dedication, and commitment that each one of them brings to the relationship. What I loved most about their wedding day was how calm, and at peace Wesley and Taylor both were, and I think that’s because of their story. 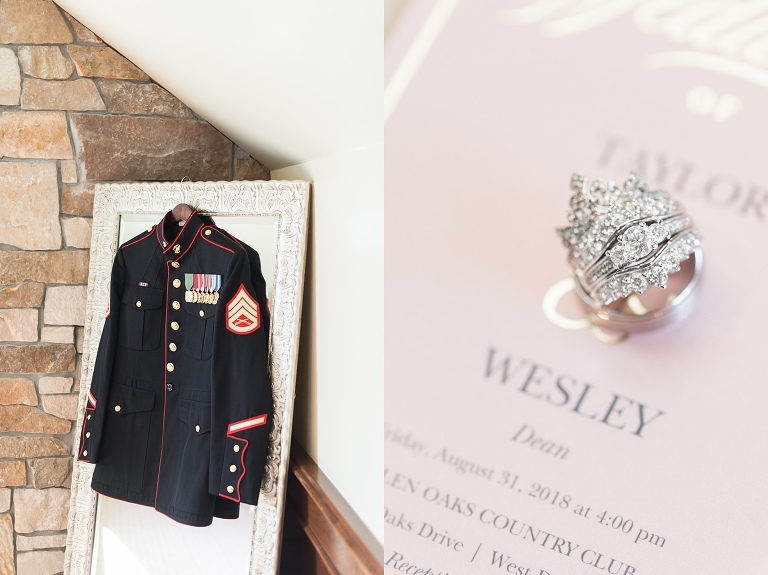 They decided to start their lives together earlier than they had originally planned, and were married during an intimate court house ceremony upon receiving word of Wesley’s deployment, so this was actually their “second” wedding…if we’re getting technical. But it was no less special, and that’s what I loved about it! Since their first wedding, they have been stationed all over the world, including:Cherry Point, North Carolina, Iwakuni, Japan, and currently Charleston, South Carolina, and now back to Iowa (briefly) to celebrate together with friends and family. The day of their wedding, it was rainy and cloudy all morning. When we checked the weather forecast, we noticed that it was supposed to rain 10 minutes before the ceremony. Yet, this didn’t stop them from declaring the love they share. They experienced some sprinkles during the ceremony, as well as some gusts of wind during portraits, but Wesley and Taylor never once complained about the weather, and neither did their bridal party! Wes and Taylor, congratulations! Thank you so much for trusting me to capture such an important day in your journey as husband and wife! Taylor’s blush, floral lace shoes added a classic feminine touch. 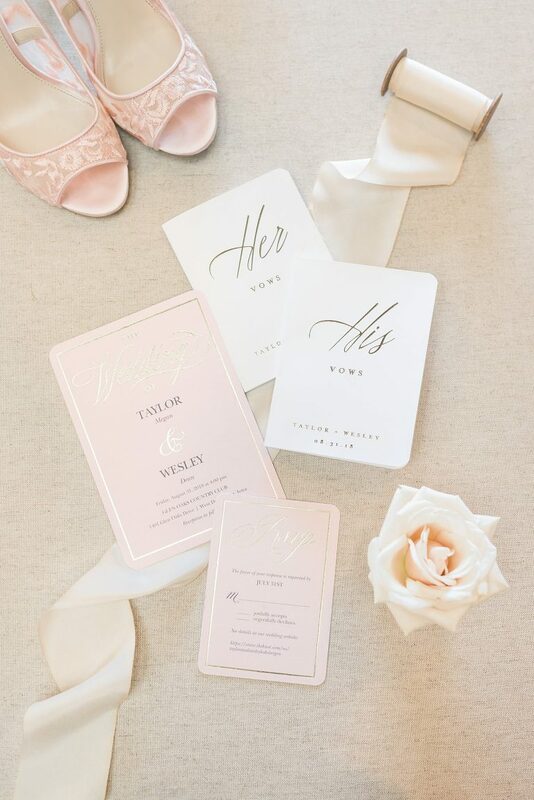 Their “his” and “her” vow books were such a unique detail to their day, and I’m sure they will cherish them for years to come. 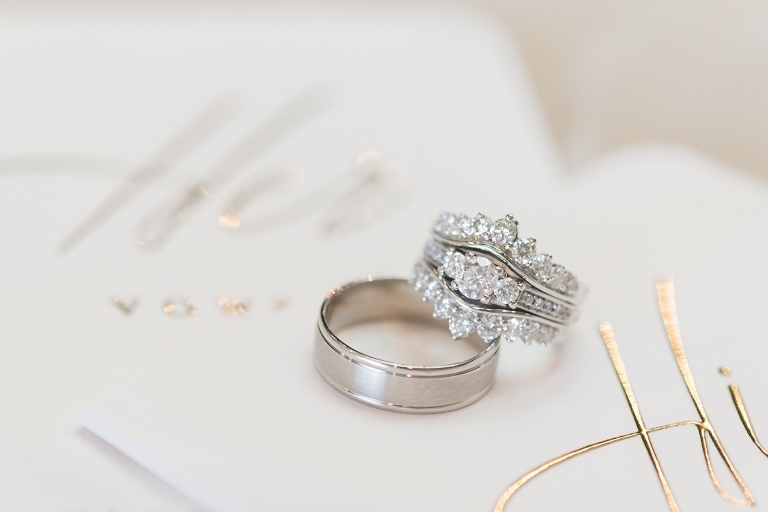 I am so in love with Taylor’s diamond wedding bands, it truly enhances her ring and gives it such a timeless and unique look! I loved the way they tied gold into their invitations, decorations, and vow books with the gold details on Wesley’s uniform. Taylor’s mother and grandmother had the honor of buttoning her into her wedding gown. There is just something magical about those last finishing touches that brings out the tears! Together, at last! Their big day was finally here, and they couldn’t wait to celebrate their marriage. Although it was windy, the weather couldn’t stop these two from smiling. The blush roses and white hydrangeas of the girls’ bouquets complimented their flowing blush pink dresses with gold sequin details. Taylor’s wedding gown had such an elegant open back highlighting the intricate lace of her dress. Glen Oaks Country Club was the perfect back drop for this fairytale romance! The wedding day would not feel complete without Chief, a Lab/Hound mix, and, Duchess, a Golden Retriever. Even Duchess couldn’t hold back a smile as her parents vowed their love to one another. In sickness and in health, in rain or sunshine. Guests entered into the reception at Glen Oaks and were greeted by a beautiful banquet and some delicious food stations. There is something so elegant about white linens, chairs, and gold accents. 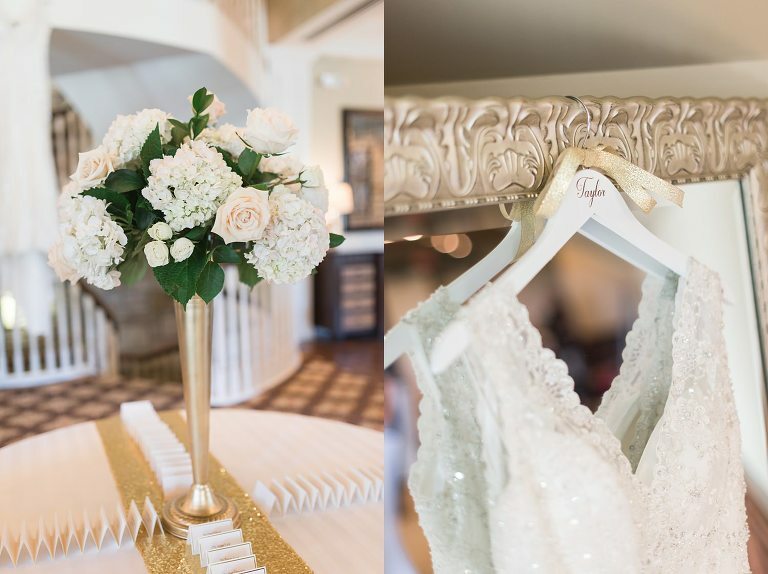 Wes and Taylor’s reception featured stately bouquets in tall vases, gold sequin runners, with blush accents. The room was so crisp, clean, and classic. One of my favorite parts of the wedding day, is whisking away the bride and the groom to capture portraits of the two of them as they soak in the day. You can just tell how happy Wesley and Taylor are to be married, and celebrating their day with friends and family. Congratulations Wesley and Taylor!